MK Eichler (UTJ) says secular "white tribe" prefers Eritrean infiltrators to hareidim, settlers. 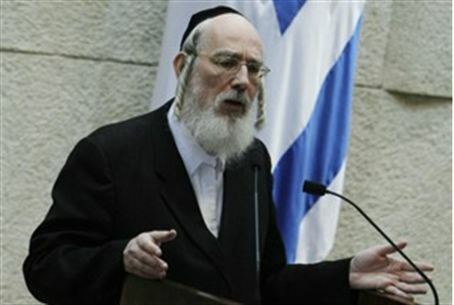 MK Rav Yisrael Eichler, Chairman of United Torah Judaism (UTJ), predicted Wednesday that religious parties would grow in size as a result of the upcoming elections. "For us and for the religious sector, the elections are well timed," he told Arutz Sheva, citing the present government's inability to renew the Tal Law that regulated the enlistment of hareidi yeshiva students to the IDF. The law was struck down by former Supreme Court President Dorit Beinisch, in one of her last decisions before retiring. The ruling destabilized the governing coalition and almost caused its downfall earlier in the year. Eichler said that the Ministry of Finance clerks who control the budget represent the wishes of the so-called "white tribe" – a term sometimes used in reference to Ashkenazi, leftist types from the Tel Aviv area. The "white tribe" cuts funding to the settler and hareidi sectors, he accused, and this discrimination will cause religious voters to fight for their rights at the voting booth. "What worries me is not the elections but what will happen after the elections," Eichler added. He expressed concern that there would be an attempt to create a government without hareidim and religious nationalists. The people promoting this idea, he explained, engage in delegitimizing certain sectors – "and I am not talking about negating the existence of the Eritreans or Sudanese or Arabs and the other sectors that the 'white tribe' protects, but the negation of the existence of the settlers and hareidim."